Haq's Musings: Should Pakistan Ignore "Washington Consensus" on Free Trade? Should Pakistan Ignore "Washington Consensus" on Free Trade? The vision to sacrifice current luxuries for future gains comes from having a visionary like Nehru or Park Chung hee at the top. 'visionary like Nehru or Park Chung hee at the top. 'To compare Nehru to Park Chung Hee is a bit of a joke...Nehru's list of failures is long but the main one is that in his fanatical and blind obsession with a socialist system, he condemned millions of Indians to remain in absolute poverty. It was certainly not about sacrficing 'luxuries for future gain': in Nehronomics, India would have been left in permanent sacrifice. It required the threat of bankruptcy to cleanse India of some of Nehrunomics. It still hasn't been cleansed well enough though, which accounts for the woes that Mr Haq gleefully keeps on parrotting over and over again. Nehru's list of failures is long but the main one is that in his fanatical and blind obsession with a socialist system, he condemned millions of Indians to remain in absolute poverty. yeah right and our industrial base just dropped out the clear blue sky post 1991 reforms didn't it? The US has dragged India to the World Trade Organization challenging its ban on imports of American poultry. India has banned shipments of US farm products, including poultry meat and chicken eggs, since 2007 to prevent the spread of avian flu. US authorities said India had imposed the ban to protect local industry and that it violates global trade rules. The move comes just days after the US created a new panel to crack down on unfair trade practices by its partners. Ron Kirk, US Trade Representative, said that India's ban was "clearly a case of disguising trade restrictions by invoking unjustified animal health concerns". "The United States is the world's leader in agricultural safety and we are confident that the World Trade Organization will confirm that India's ban is unjustified." Unfair trade practices? This from the country with the highest subsidy for its on farm sector. South Korea,Taiwan,Japan could get away with blatantly mercantalist trade policies because they were on the frontline against communism and the west had other priotities back then so treated them with kid gloves. Mercantalism obviously is the best model IF you are allowed to get away with it.The point is people have wisened up and S Korea type modernization is basically impossible in todays enviornment. Chinese growth is stalling as it is simply too big to export its way to prosperity on a per capita basis the world economy is simply too small for China to be exporting as much as south korea as % of GDP when its income approaches 25,000 USD per capita. @Anonymous: We don't have much of an industrial base unfortunately. To have stifled private enterprise and invested millions in a handful of heavy industries which kept on producing shoddy goods was among Nehru's crimes. And because of that misplaced zeal for the 'temples of modern India', we ended up neglecting basic infrastructure which is why we continue of have this mass of the illiterate, hungry and poor. What is required today is to throw off the yoke of Nehru and Indira and Rajiv and indeed, that entire dynasty. In the context of the examples that you provide and in my own humble opinion, i fully support the idea of the "east asian development model", so to speak. This is beginning to make more sense, especially in the indian context. The idea of democracy is proving to be more of a burden than an enabler. The multitude of voices only creates chaos. Debates and discussion are passed off as an excuse of tangible action. In the indian context, add to this - the federal structure of governance, vested interests of the regional political parties, and undermining of the authority of the centre - and voila...we have the perfect recipe for policy paralysis. A regime which practices democracy right down to the letter, I feel, is the answer, but also unlikely. The limitations that regional politics imposes, is fast threatening the Indian growth story and making the double digit growth figures all the more elusive. Thank you for the input on the question of trade with India, a clear cut recommendation was not visible. What ever I have learned from various discussions on the TV on this subject, it shows that the Indian goods are reaching Pakistan through a third country where they are exported by India and labelled as Made in Taiwan or Singapore etc, but in the process Pakistan ends up paying 20 to 30% extra to cover profits of two countries, India and the third country, plus significant additional amount for freight etc. So what is the harm in importing these same items directly from India and save 30%, without increasing India's profit or sale, in this process we will be able to sell some things like cement etc to the large Indian market. Tahir: "Thank you for the input on the question of trade with India, a clear cut recommendation was not visible." I am not against trade with India or anyone else for that matter. But it's naive to go into it with the orthodoxy of the Washington Consensus that there are only benefits and no downsides for Pakistan. Rather than being motivated to engage in free trade as a matter of faith, Pakistanis need to learn to play this game of trade artfully to their advantage, as others like East Asians and Europeans have done. At a minimum, Pakistan should implement MFN trade with India to ensure it's a win-win for the long-term, not a win-lose proposition. Vicks: "We don't have much of an industrial base unfortunately. To have stifled private enterprise and invested millions in a handful of heavy industries which kept on producing shoddy goods was among Nehru's crimes"
1. Investing in India's higher education sector by establishing the elite IIT system. 2. Supporting & protecting industrialists like Tata & Birla as a strategy to promote heavy manufacturing. 3. Emasculating the powerful landowners to marginalize their power & influence in Indian politics. Chinese Free Trade Imports have led to over Thirty Pakistani Industries having gone up the creek without a paddle. They are closed – wiped out. Pakistani Industrialists can only take that much. The closures due to Free Trade with India will break the Camel’s back. South Korea plans to fully consider potential fallout for "sensitive industries" that may be hurt if a free trade agreement (FTA) with China is reached, a senior government policymaker said Friday. Trade Minister Park Tae-ho said in a meeting with large industrial organizations that the government plans to do all it can to reflect the views of local manufacturers and the farming sector in formal FTA talks with Beijing. "Every effort will be made to constantly listen to the opinions of farmers, fishermen and businesses that may be affected by market opening," he said. The official said that with China’s domestic market growing at a robust pace, there is a pressing need to formulate a strategy to capture market share ahead of increased competition, hinting that a FTA will give South Korea an extra advantage. Related to the stance by the trade minister, Lee Dong-geun, the vice chairman of the Korea Chamber of Commerce and Industry, pointed out that China is already the world’s No. 2 economy and the largest importer of South Korean goods. "In the medium to long term, a South Korea-China FTA is inevitable," he claimed. The business group leader, however, stressed that Seoul must try to win concessions from China in certain sectors that are vulnerable such as the farming and industries currently dominated by small and medium enterprises (SMEs). SMEs generally do not have the competitiveness of big conglomerates like Samsung and Hyundai, and could be hit hard if cheaper priced products pour into the country. At the same time, Lee said negotiators need to get China to open its service and government procurement markets, as well as address non-tariff barriers and other complications, and administrative red tape that have hindered investments. Other business groups such as the Korea Automobile Manufacturers Association, the Korea Association of Machinery Industry and Korea Federation of Textile Industries concurred on the need for a FTA, yet called for various safeguards. They called for special safeguards to legitimately stem sudden surges in cheap imports and measures to prevent unfair trade practices such as illegal undercutting of goods prices that can distort the market and hurt local firms. POINT 2 AND 3 are because the Industrialists financed the Congress party and the feudals(both indu and Muslim) were pro British.Which is why the congress party broke the back of natural 'traitors' which was agenda #1.Lots of rank and file congress members had personal axes to grind against the feudals.Which is why in most Hindi movies feudals/zamindars are always shown in a bad light. He did not support the industrialists out of some grand vision but the neessity of financing the congrss party machinery. His commanding heights theory favoured large public sector companies many of which were a drag on the Indian economy.He explicitly BANNED India Inc from defence due to his fears of a military industrial complex forming and subverting democracy blah blah.He was a bit too much of a thinker you see. Also absurd situations occured due to his fabian socialist mistrust of private capital.He banned highly competent companies like L&T and Tata from entire sectors like defence and instead reserved these for DRDO's infamously incompetent companies the result is we import massive amounts of arms from western private companies but disallow our own world class corporations for doing the same. Though that is changing(at last! ).The hull of our nuclear submarine is made by L&T and the Combat management system is made by TATA advanced systems. This is basically their first major defence project and it is on time and under budget!Just imagine the success if they were involved similarly in everything else! According to EIU, Pakistan and to a lesser extent India have hurt their economies directly as a result of the hostile relations and lack of trade. Since independence, Pakistan's GDP took a hit of 1% per year which roughly means each Pakistani would have been 80% richer than what he is today. India on the other hand suffered a hit of 0.25% per year which indicates average Indian would have been 20% better than today. Now that seven American pro-democracy workers have been allowed to post bail and return to the United States, perhaps we can examine what the U.S. was up to in Egypt using reason instead of patriotic emotion. The Egyptian furor over such seemingly idealistic work may strike us as wild and idiotic, but in fact, the Egyptians have a right to be suspicious. America's attempt to promote democracy around the world through private organizations has unsavory beginnings and a sometimes troubling history. The program stems from a discredited CIA operation. In the 1950s and '60s, during the Cold War, the CIA set up a group of phony foundations to funnel CIA money to private groups that were either anti-communist or, at least, non-communist. Among the recipients were the AFL-CIO, the National Student Assn. and the magazines Encounter in London and Transition in Africa. Some did not even realize they were operating with CIA subsidies. When the secret operation was exposed in Ramparts magazine and other U.S. publications, there was great embarrassment, and President Lyndon Johnson put a stop to such CIA funding. But many in Congress felt that the program's problem lay only in its ties to the CIA. Cut those ties and make everything aboveboard, they argued, and the attempt to win hearts and minds to the American way would be useful and benign. In the 1980s, during the Reagan administration, Congress created the National Endowment for Democracy to take the place of the defunct CIA program. Under the law, the endowment divided its money among four new institutes created to sponsor programs encouraging democracy throughout the world. The four institutes were run by the Republican Party, the Democratic Party, the AFL-CIO and the U.S. Chamber of Commerce, supposedly ensuring the participation of the major American ideologies and interests. nice sounding statement only that Pakistani industry is non competetive vis a vis Tata and the gang who routinely beat European industry in their own back yard for industrial contracts. What Pakistan should do now is raise high tarriffs on ALL INDUSTRIAL IMPORTS and buy local even abysmal quality stuff like S Korea and India did when the base was being built. PAkistan is not a small singapore that can live on trade and services without an industrial base the economy will not have any backbone and always be dependant on foreign benefactors. Amen and Zardari is going to lead Pakistan supported by the wise Pakistani army when he imposes tariffs on imports from 'higher than mountains' friend China! That plus the fact that tax/GDP is about 8% and the country needs IMF/US etc etc funds to survive. You don't build your own industrial base with someone else's money! Anon: "You don't build your own industrial base with someone else's money! " Most of India's economic boom has been driven by foreign inflows, and their recent drop has cooled Indian economy. A SAARC FTA will resemble NAFTA a lot more than the EU in europe Germany,France,UK are roughly the same size with Italy,Spain about 50% of these thus self balancing. In S Asia India is 10 times the size of Pakistan and growing 3 times faster. Also and this is not PC Europeans are all white Christians (look at the way they keep refusing Turkey admission) Is India seriosuly ready to share its economic gains with muslim neighbours? or tie its economic fate with their success or failure? I think not.Though by the time the FTA with India gets finalized the Chinese would have wiped out Pakistan's light industry anyway so in that way I don't see any extra harm that can be done to PAkistan by India. It's an obvious question to ask at a time when powerful - and populist - regional parties are again flexing their muscles at a fickle federal government, key economic reforms are seemingly stuck in the bog of messy coalition politics, and the government is struggling under an avalanche of corruption charges. Economic growth and investment have cooled and inflation remains high. So is it surprising that The Economist magazine, in its latest issue, says the politics is "preventing India from fulfilling its vast economic potential"? Or when Fareed Zakaria, editor-at-large with Time magazine, tells an audience in Delhi this week that India's politicians are "out of touch… they try to portray India as a victim, not the victor". With uncharacteristic exaggeration, The Economist even invokes a return to the stifling days of the controlled economy. "Lately, like a Bollywood villain who just refuses to die, the old India has made a terrifying reappearance," says the magazine. It blames a "nastily divisive political climate" for the crisis and believes that India requires "energetic, active leaders, plus politicians who are ready to compromise". Both the magazine and the pundit are right and wrong. The quality of India's politicians, many argue, has declined drastically, as in many parts of the world. Most of them seem to be out of sync with modern day realities - expectations have fallen so ridiculously low that an iPad carrying politician is described by the media as a modern one! Most are also seen as greedy, corrupt and disinterested in serious reform. The increasing number of politicians with criminal records and the brazen use of money to buy party tickets and bribe voters erodes India's ailing democratic process. It is not a happy picture. "Today the Centre is corrupt and corroded," historian Ramachandra Guha wrote recently. "There are allegedly 'democratic' politicians who abuse their oath of ofﬁce and work only to enrich themselves; as well as self-described 'revolutionaries' who seek to settle arguments by the point of the gun." Only serious electoral reform can ensure a better breed of politician. Public consensus is harder to come by in an awfully unequal society where the middle class and the rich root for further opening up of the economy, while the poor want the state to invest in health and education and check corruption. The elitist biases in public policy is made easier by a poorly-informed and often unlettered electorate with low expectations. Many would argue that India never got any magic going, so there is no question of losing it. Consensus is painfully slow in such a society, and sometimes only a crisis can provoke the government - and the people - to bite the bullet. Reformers need to be patient; there are no shortcuts in India. Pakistan has spent 43.5 percent (or $3.815 billion) more dollars during the July-April 2011-12 period on import of petroleum products as during the ten-month period the country imported petroleum products worth $12.58 billion against $8.76 billion in corresponding period last year, according to official data. During the period petroleum imports were one-third of the country’s total imports of $37.04 billion. Petroleum group was followed by agricultural and other chemical group imports of $5.98 billion showing an increase of 16.77 percent over $5.12 billion last year. Machinery imports also secured a sizable share in country’s total imports during the period under review and it stood at $4.567 billion against $4.41 billion last year, showing a rise of 3.5 percent. Pakistan Bureau of Statistics (PBS) bulletin indicates that under the petroleum group, petroleum products import stood at $8.35 billion against $4.92 billion last year, showing an increase of 69.8 percent. Besides, crude petroleum import also showed an increase of 49.9 percent to $4.23 billion during these ten months from $3.85 billion in same period last year. Under the agricultural and other chemical group, manufactured fertilizers import up by 116.5 percent to $1.082 billion, plastic materials by 1.88 percent to $1.28 billion, while imports of insecticides were down by 9.76 percent to $110.39 million and medicinal products reduced by 3.1 percent to $548.66 million over July-April 2010-11. In the machinery group, textile machinery import declined by 15.11 percent to $339 million against $399.4 million same period last year. Telecom sector import was up by 22.85 percent to $1.05 billion; power generation machinery import increased by 1.3 percent to $877 million; electrical machinery and apparatus import increased by 0.07 percent to $675.3 million; agriculture machinery by 32.7 percent to $103 million; office machinery by 22.6 percent to $239.8 million; construction and mining machinery by 12.6 percent to $111 million over same period last year. During the period, Pakistan spent $568.75 million which was 29 percent more than last year imports of $441.05 million. In the transport group, imports reduced by 7.26 percent to $1.67 billion from $1.8 billion last year. However, under the completely built units (CBU) during July-April 2011-12 imports of buses, trucks and other heavy vehicles imports increased by 91.3 percent to $122 million and motor cars 161 percent to $285.4 million. While, under the completely knocked down/semi knocked down category, imports of buses, trucks and other heavy vehicles imports up by 27.1 percent to $120.47 million, motorcycles 27.1 percent to $74.92 million, however, motor cars imports down by 1.14 percent to $389.78 million over same period last year. The food import declined by 1.73 percent to $4.23 billion from $4.31 billion in July-April 2010-11. In this group, on palm oil import economy spent $1.89 billion which is 18 more than last year. Tea imports up by 4.76 percent to $301.9 million, while pulses import down by 7 percent to $320.27 million and spices imports down by 5.16 percent to $86.57 million over same period of last year. In textile group, total import was of $1.98 billion against $2.42 billion depicting 18.26 percent decline over corresponding period of last year. The reason why Pakistan did not manage to match Korea's *long-term* performance is because Pakistan did not have a plan to boost gross domestic savings. On the other hand, Korea's government correctly used the fast low-ICOR growth of the sixties to actively promote the growth of savings-rates. Korea then channeled the rapidly rising savings into productive heavy industrial investment in the seventies & eighties to generate fast high-ICOR growth. 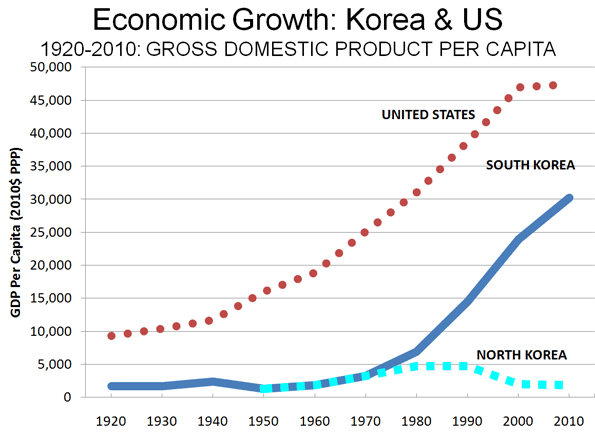 This is how Korea became an a moderately industrialized country by the nineties and has now become a "fully" industrialized one. The simple fact that we have still not been able to move beyond low-ICOR light industry-- because we just do not have the savings to do so-- is precisely why Pakistan is still a Third World country. Here is the data from the World Bank. Just look at Korea's performance from 1960-1990 (from 3% savings to 36% savings in 30 years) savings and compare it to ours (going nowhere in particular). Replace Pakistan with Thailand, Indonesia and Malaysia in the URL to get their data. Pakistan's Export of Manufactures in 1969 was almost 3 times that of Thailand, Indonesia & Malaysis combined! "Pakistan's Export of Manufactures in 1969 was almost 3 times that of Thailand, Indonesia & Malaysis combined!" (1) On a combined basis, they overtook us 1973. (2) Malaysia, by itself, overtook us in 1974. (3) Thailand, by itself, overtook us in 1979. (4) Indonesia, by itself, overtook us in 1983. Riaz Haq: "Most of India's economic boom has been driven by foreign inflows, and their recent drop has cooled Indian economy." Why? Why do you keep doing this? Again and again? Why? Have we not been through this issue many times before? We must face the facts. We must accept the truth. Our denial must now end. Only then can we begin to heal, change and progress. After the post-Cold-War reforms in 1992, their economy is *still* principally driven by internal savings (now on average 84%), with Remittances now contributing 9%, FDI & FPI together contributing 5.5% and Aid contributing 1.5% (all on average). HWJ: "One key difference immediately visible is that their economy has *always* been driven principally by Internal Savings. All the others (FDI, FPI, Remittances & Aid) are actually relatively less important to their economy." High internal savings didn't save India from 1991 BOP crisis. India's rupee-denominated savings didn't amount to a hill of beans....they couldn't be used to buy even an ounce of oil on the world market. Unlike China and other BRICs, India runs huge trade deficits and external inflows have been crucial to India's economic growth in the last two decades. ^^^Riaz Haq Wrote: "High internal savings didn't save India from 1991 BOP crisis. Unlike China and other BRICs, India runs huge trade deficits and external inflows have been crucial to India's economic growth in the last two decades." The discussion above was not really about BOP crises. The discussion was about whether or not we can build our industrial base with foreign money. And the answer is NO. No chance whatsoever. Zilch. The ONLY way a country can build its industrial base is with HIGH domestic savings & high domestic investment. There is not a single country in the world which industrialized using foreign savings & investments. None. Zero. There are no "shortcuts" to the goal of industrialization and development. You might not like to hear this, but it is the truth. You can pout, stamp your feet and throw a tantrum. But, at the end of it all, the truth will still be there completely unchanged. It is almost Quranic. 1) Like India does today, SK ran constant current account deficits from 1960 to 1997 when it was rapidly industrializing. 2) SK has a BOP crisis in 1997 that was identical to India's in 1991. 3) Contrary to popular belief, which you seem to share, these crises were NOT caused by the running of current account deficits per se, nor were they caused by flight of "hot-money". Instead, they were caused by the WAY in which these deficits were financed using short-term debt based on unhedged or inverted balance sheets. 4) The 1991 Indian crisis & the 1997 South Korean crisis were both caused by the fact that short-term external-debt exceeded Forex reserves, therby putting them in a squeeze when their maturing ECBs were not rolled-over. They were NOT caused by capital flight as our 1998, 2001 & 2008 BOP crises were. South-Korea's 1997 & India's 1991 problems were not structural; they were caused by the use of non-optimal financing options. 5) The lesson has been learnt and today's short-term external-debt to Forex-reserves ratios are held <20% by most countries. 6) Note that our repeated BOP crisis since the late nineties (1998, 2001, 2008) were NOT caused by non-optimal financing using unhedged balance sheets. They were fundamentally structural in nature as they were caused by massive capital flight from a capital-poor economy. These concepts are really basic and not at all hard to understand. If you just take the time to study the subject, you will be able to appreciate the nuances of these discussions quite readily. TAKE THIS TEST: China runs a massive current account surplus. Do you believe that this is a sign of China's strength? If you answered YES, you would be in the company of the majority of people. However, you, along with the majority of people, would be WRONG. Macroeconomically speaking, China's massive current account surplus while it is still a developing country is a sign of its WEAKNESS. And you will see this weakness manifest itself in the next 8-10 years when China's structural problems become public knowledge. China's massive current account surpluses are a terrible symptom of a fundamental underlying flaw in the structure of its economy. China is heade for very serious trouble. ^^^"..High internal savings didn't save India from 1991 BOP crisis.."
I thought you might like to play with it. Might be fun. I really wish someone would come up with an analysis and a calculator for our BOP situation. But I suppose since our economy is much smaller, these global media people will always be ignoring our situation. Let me know if you find any interesting scenarios when you play with their India-BOP calculator. ^^^HWJ Wrote: "TAKE THIS TEST: China runs a massive current account surplus. Do you believe that this is a sign of China's strength? If you answered YES, you would be in the company of the majority of people. However, you, along with the majority of people, would be WRONG"
BBC is covering this issue right now. What are your views? Which side of the debate do you find more plausible or logically-sound? And why? Therefore, there is TREMENDOUS scope for importing these things from India. So the scope for exporting these things to India is obviously severely LIMITED. Under these circumstances, how will free trade really work? What will we export to India, apart from a few fashionable clothes, Shan masalas, Himalayan salt et cetera? What are your views on this issue? Do you agree with the sketch that shows the "made in India" road-roller approaching our shallow & limited industrial base? Please explain for the benefit of your readers. KARACHI - The country’s trade balance slid by a significant 19.7% MoM to a comfortable $ 1.743 billion in Jun-13, said the analysts at InvestCap Research citing data recently issued by the Pakistan Bureau of Statistics. Whereas the exports on a monthly basis inched up slightly by 1% MoM to $2.197 billion in Jun-13, the imports stepped down by 9.4% MoM to USD3.940 billion. “Such a trend can be explained by the absence of fertilizer imports in Jun-13, whereas the same stood at 97k tons in May-13 (USD53.7mn), the contribution of Urea to Jun-13 figures was absent due to delay in supply which is now expected to be received by the end of July-13,” said InvestCap analyst Muniba Saeed. Further, she said, contributors to the declining imports are expected to be fall in palm oil imports (importers already having stocked up for Ramadan), decline in imports of textile machinery and falling imports of generators. On an annual basis, the imports remained essentially stagnant increasing by a meager 0.08% YoY, climbing to a level of $44.950 billion in FY13. “Such a trend was witnessed despite decline in imports of petroleum products, fertilizer and the food group; the three heads combined contributing roughly 60% to total imports for the year,” the analyst said. The same was, however, negated by increased imports of machinery and the textile group leading to the imports head remaining effectively the same as last year, she said. Exports on the other hand increased by 3.78% YoY adding an additional USD894mn to the head to reach USD24,518mn. Such expansion is expected to be led by increased exports from the food group where sugar is projected to be the major contributor in fuelling such growth. Exports from the other heads are however expected to have subsided during the same period where major contribution is anticipated from the textile and petroleum group. The trade balance for FY13 as a result posted a decline of 4% YoY, descending to an amount of USD 20,432mn.